Upon arriving, you are sent down the trail to find your cabin. You will notice a camp fire on the beach sending smoke signals. The big tree with attachments for a zip line, rope swing, and Jacob's ladder. The fragrance of the waving pines begin to excite you. Diversion! You break into a run and start to yell at the first kid you recognize. "Hey wait up" "Where are you going?" Camp Vanasek is located approximately 4 miles northwest of Brainerd. It contains 50 acres of private lakeshore prorperty and a large sugar sand beach. Camp consists of a modern kitchen and mess hall where all meals are prepared fresh and nutritious by our own staff. Seven rustic cabins are scattered throughout the camp. Each cabin will house 4-7 campers plus a counselor for younger children. There are rest rooms on both sides of camp and a shower house. The majority of our training and activities are outside. Safety is top of the list, campers are under constant supervision. Upon receiving your registration, you will be sent a detailed letter of what to bring and how to pack for camp. You will also be sent a questionnaire about your child's health, allergies, medications, or other personal issues that you or they may be concerned with. Training 3:00 p.m. - 4:00 p.m. Team Games 4:00 p.m. - 5:00 p.m. Talent Show Planning 7:30 p.m. Popcorn & Movie 9:00 p.m.
Training 7:30 a.m. - 8:30 a.m.
Training 10:00 a.m. - 11:00 a.m. Ancient Battle 1:30 p.m. - 2:30 p.m.
Hammer Fist Demos 2:30 p.m.
Kata Training 3:15 p.m. - 4:15 p.m.
Camp Talent Show 7:30 p.m.
Free Time 11:00 a.m. - 12:00 p.m.
Last Training 1:30 p.m. - 2:30 p.m.
Free Time 2:30 p.m. - 4:00 p.m. Pack It Up 4:00 p.m. Check out: Friday, June 20th, 6:00 p.m. - 6:30 p.m.
Because of camp restructure, we have limited enrollment this year! 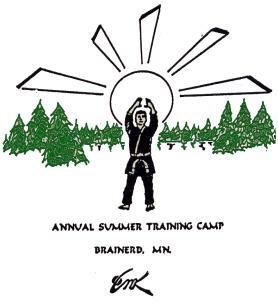 Requirements: Campers must be 7 years or older with traditional Shotokan Karate experience. Campers must also have good manners, be willing to share and take turns and like to play and work hard. Camp tuition includes: 3 days, 2 nights lodging, Camp T-shirt, nutritious meals, all training sessions, use of all equipment, miscellaneous entertainment, and a lot of FUN! Registration: Nonrefundable pre-registration of $50 required by June 7, 2014. Balance to be paid on the first day of camp or sooner. A detailed questionaire about your child will be sent to you after you register, along with more information about camp and how to pack.